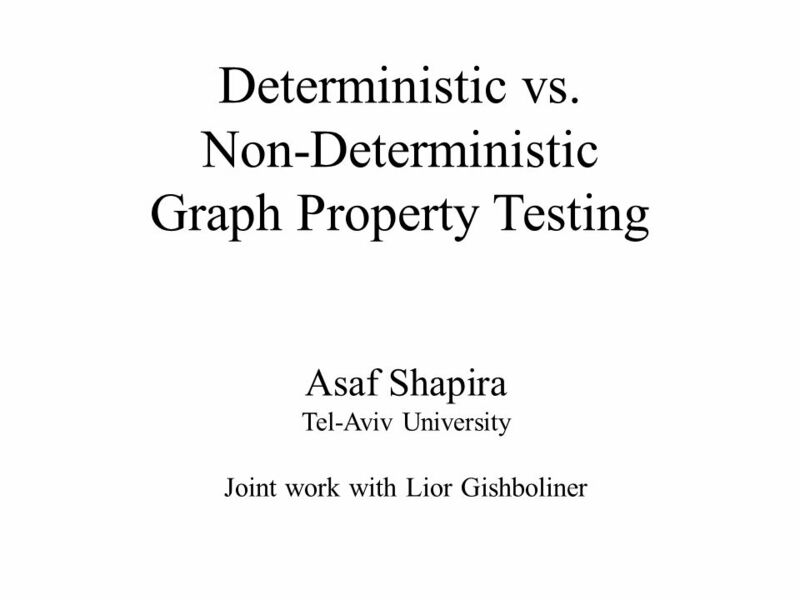 Deterministic vs. Non-Deterministic Graph Property Testing Asaf Shapira Tel-Aviv University Joint work with Lior Gishboliner. 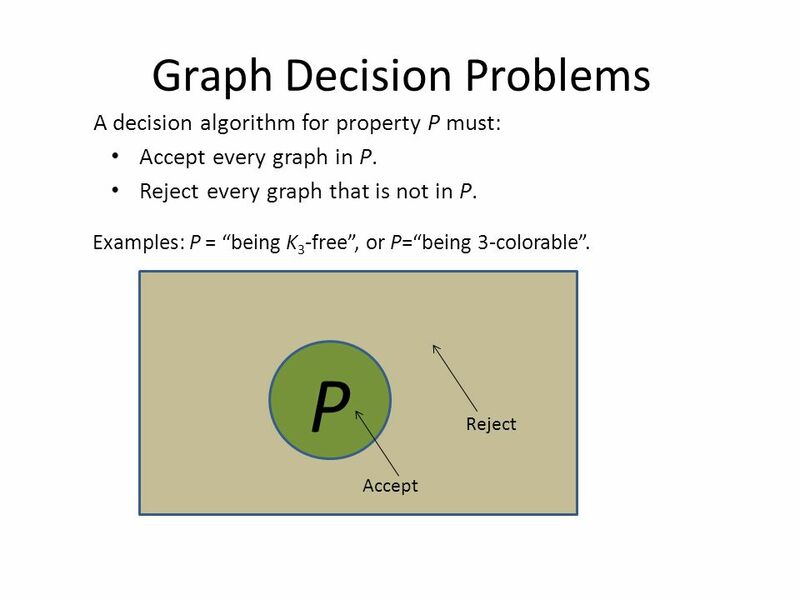 3 Graph Decision Problems P Accept Reject A decision algorithm for property P must: Accept every graph in P. Reject every graph that is not in P. Examples: P = “being K 3 -free”, or P=“being 3-colorable”. 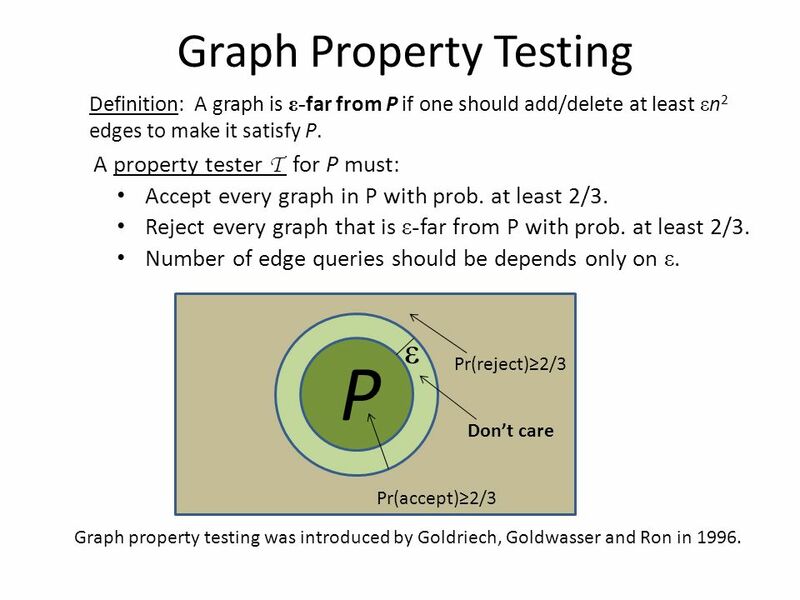 4 P ε Pr(accept)≥2/3 Pr(reject)≥2/3 Don’t care Graph Property Testing A property tester T for P must: Accept every graph in P with prob. at least 2/3. Reject every graph that is ε- far from P with prob. at least 2/3. 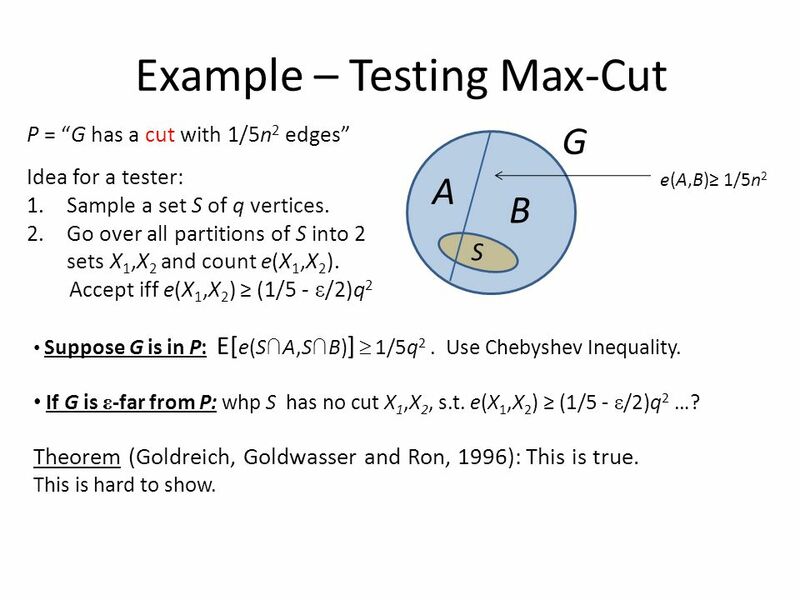 Number of edge queries should be depends only on ε. Graph property testing was introduced by Goldriech, Goldwasser and Ron in 1996. 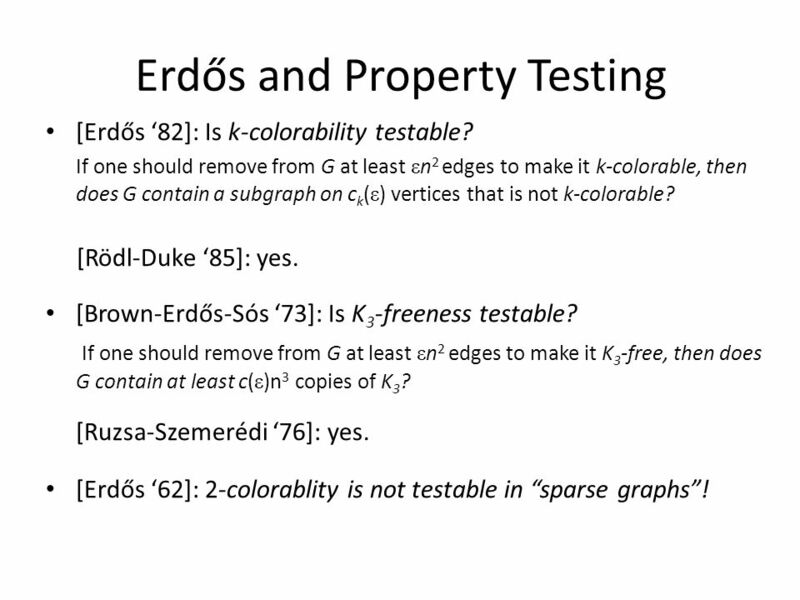 Definition: A graph is ε- far from P if one should add/delete at least ε n 2 edges to make it satisfy P.
5 Erdős and Property Testing [Erdős ‘82]: Is k-colorability testable? If one should remove from G at least ε n 2 edges to make it k-colorable, then does G contain a subgraph on c k ( ε ) vertices that is not k-colorable? [Rödl-Duke ‘85]: yes. [Brown-Erdős-Sós ‘73]: Is K 3 -freeness testable? If one should remove from G at least ε n 2 edges to make it K 3 -free, then does G contain at least c( ε )n 3 copies of K 3 ? [Ruzsa-Szemerédi ‘76]: yes. 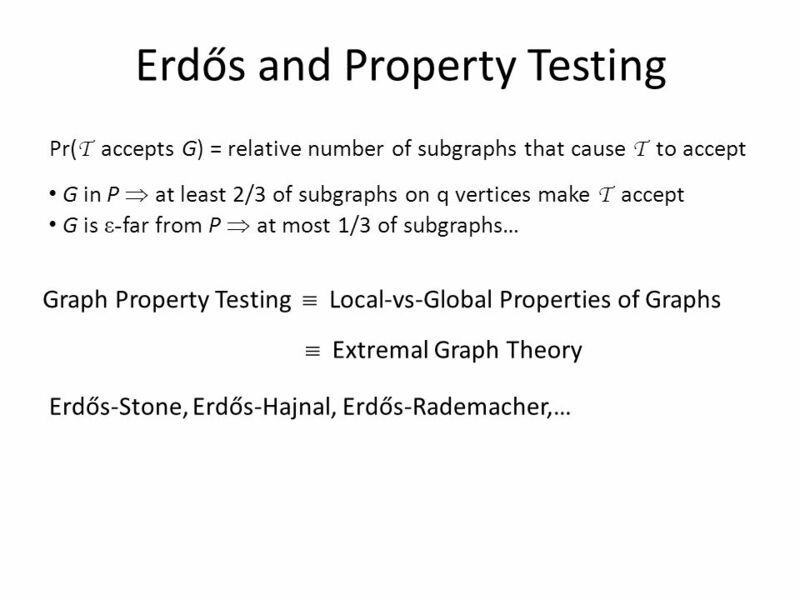 [Erdős ‘62]: 2-colorablity is not testable in “sparse graphs”! 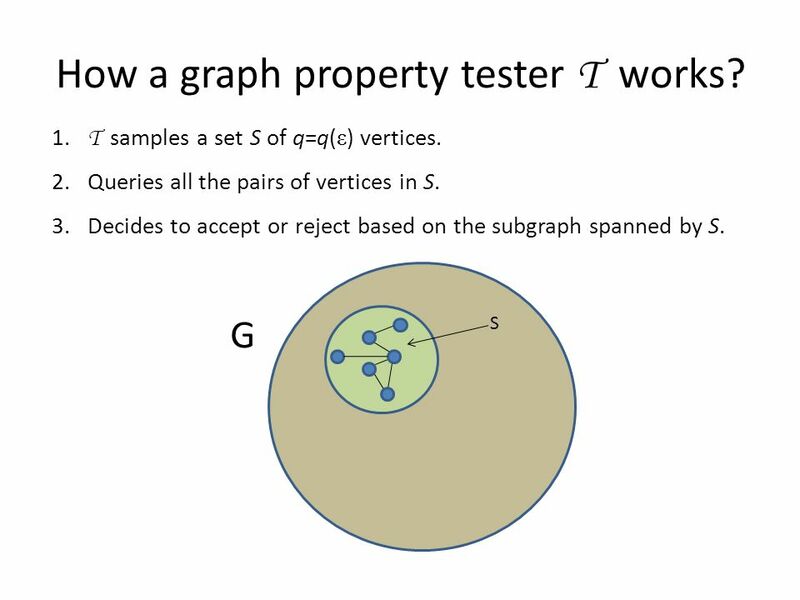 6 How a graph property tester T works? S G 1. T samples a set S of q=q( ε ) vertices. 2. Queries all the pairs of vertices in S. 3. Decides to accept or reject based on the subgraph spanned by S.
8 Triangle-freeness [Ruzsa- Szemerédi ‘76 ] k-colorability [ Rödl-Duke ‘85 ] Having a large cut [Goldreich-Goldwasser-Ron ’96] Which Properties Are Testable? 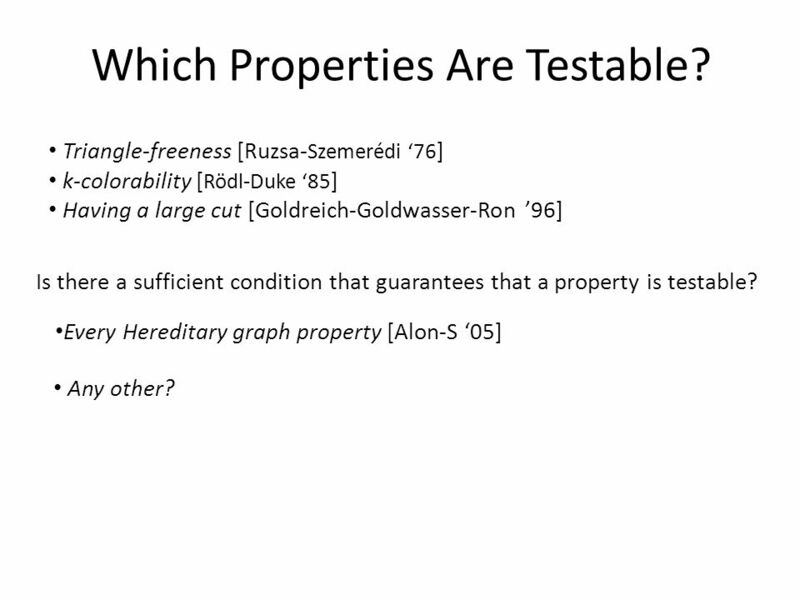 Is there a sufficient condition that guarantees that a property is testable? Every Hereditary graph property [Alon-S ‘05] Any other? 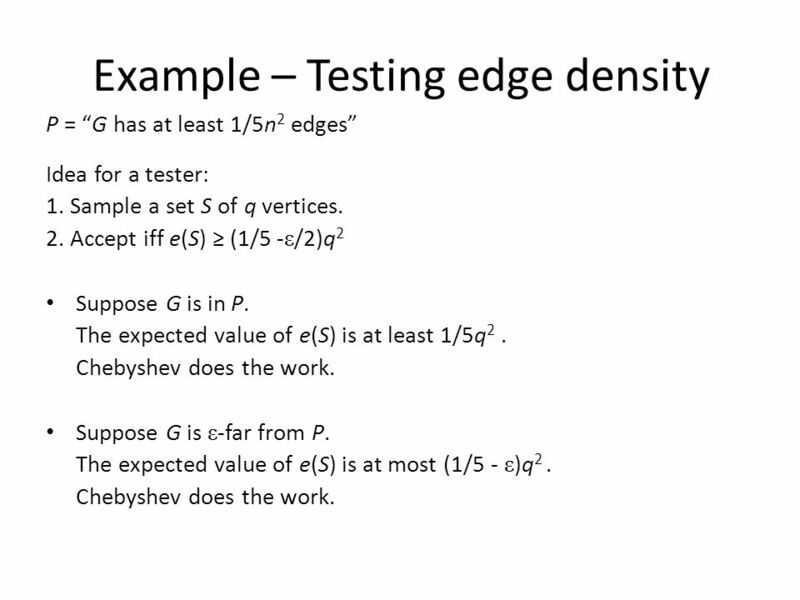 9 Example – Testing edge density P = “G has at least 1/5n 2 edges” Idea for a tester: 1. Sample a set S of q vertices. 2. Accept iff e(S) ≥ (1/5 - ε /2)q 2 Suppose G is in P. The expected value of e(S) is at least 1/5q 2. Chebyshev does the work. Suppose G is ε -far from P. The expected value of e(S) is at most (1/5 - ε )q 2. Chebyshev does the work. 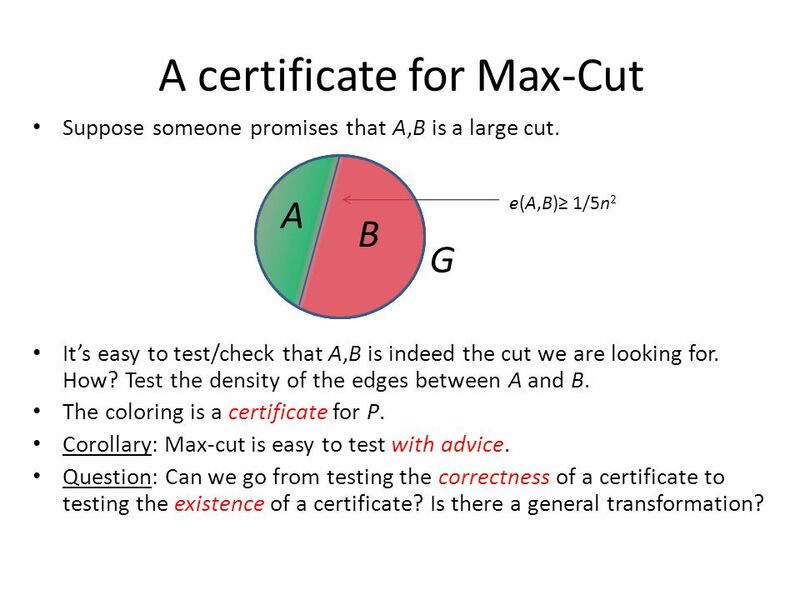 10 Example – Testing Max-Cut G A B e(A,B)≥ 1/5n 2 S P = “G has a cut with 1/5n 2 edges” Idea for a tester: 1.Sample a set S of q vertices. 2.Go over all partitions of S into 2 sets X 1,X 2 and count e(X 1,X 2 ). Accept iff e(X 1,X 2 ) ≥ (1/5 - ε /2)q 2 Suppose G is in P: E[ e(S ∩ A,S ∩ B) ]  1/5q 2. Use Chebyshev Inequality. If G is ε -far from P: whp S has no cut X 1,X 2, s.t. e(X 1,X 2 ) ≥ (1/5 - ε /2)q 2 …? Theorem (Goldreich, Goldwasser and Ron, 1996): This is true. This is hard to show. 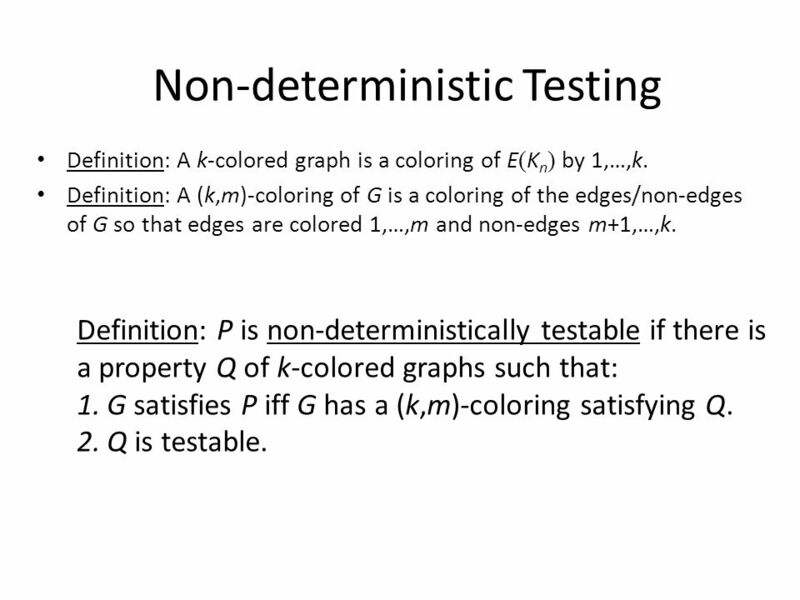 12 Non-deterministic Testing Definition: A k-colored graph is a coloring of E ( K n ) by 1,…,k. Definition: A (k,m)-coloring of G is a coloring of the edges/non-edges of G so that edges are colored 1,…,m and non-edges m+1,…,k. 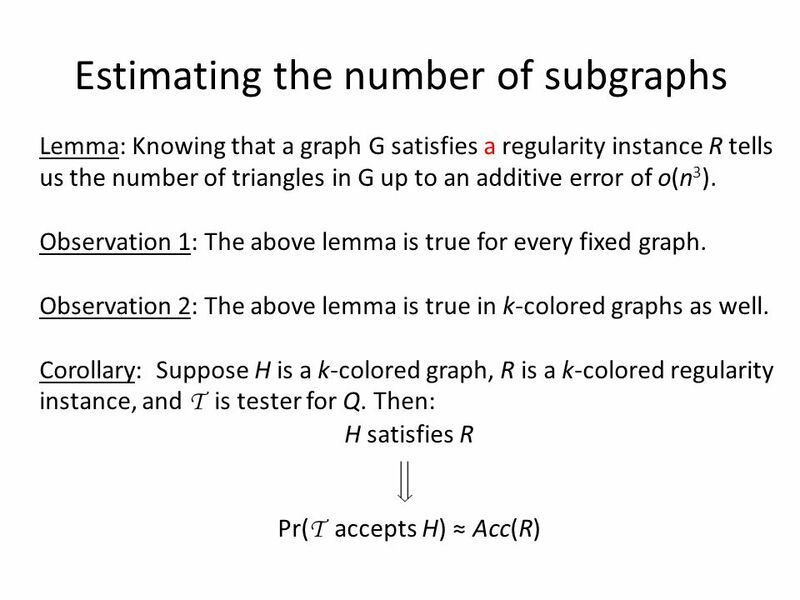 Definition: P is non-deterministically testable if there is a property Q of k-colored graphs such that: 1.G satisfies P iff G has a (k,m)-coloring satisfying Q. 2.Q is testable. 13 The Lovász -Vesztergombi Theorem. 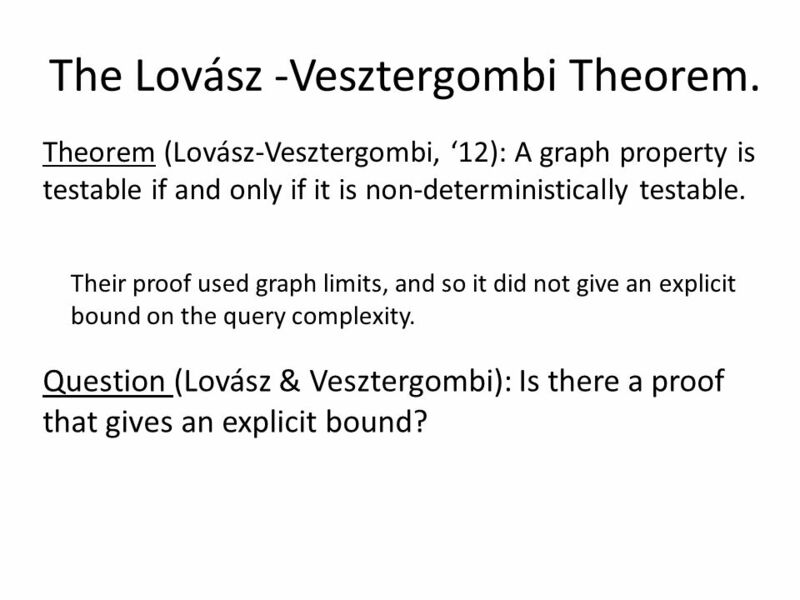 Theorem (Lovász-Vesztergombi, ‘12): A graph property is testable if and only if it is non-deterministically testable. Their proof used graph limits, and so it did not give an explicit bound on the query complexity. Question (Lovász & Vesztergombi): Is there a proof that gives an explicit bound? 14 Our Main Result Question (Lovász & Vesztergombi): Is there a proof that gives an explicit bound? Theorem (Gishboliner-S ‘13): Yes. 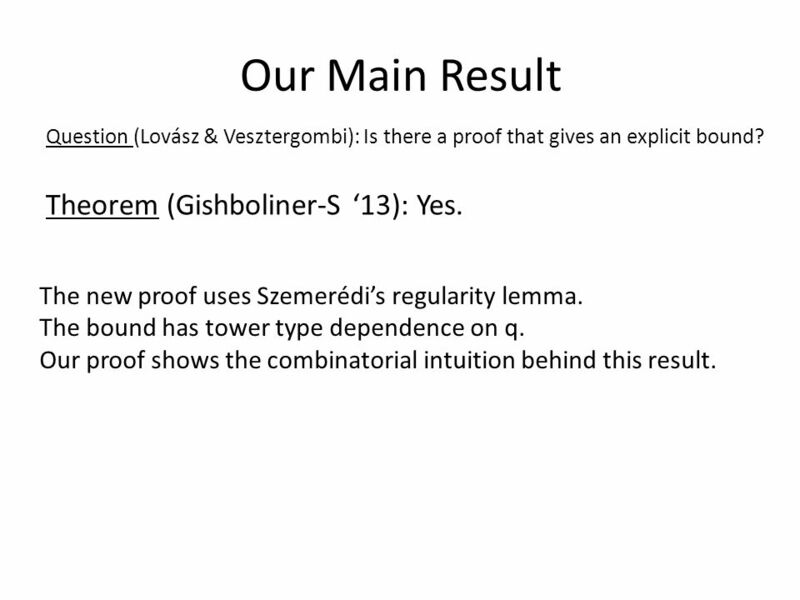 The new proof uses Szemerédi’s regularity lemma. The bound has tower type dependence on q. Our proof shows the combinatorial intuition behind this result. 15 2. 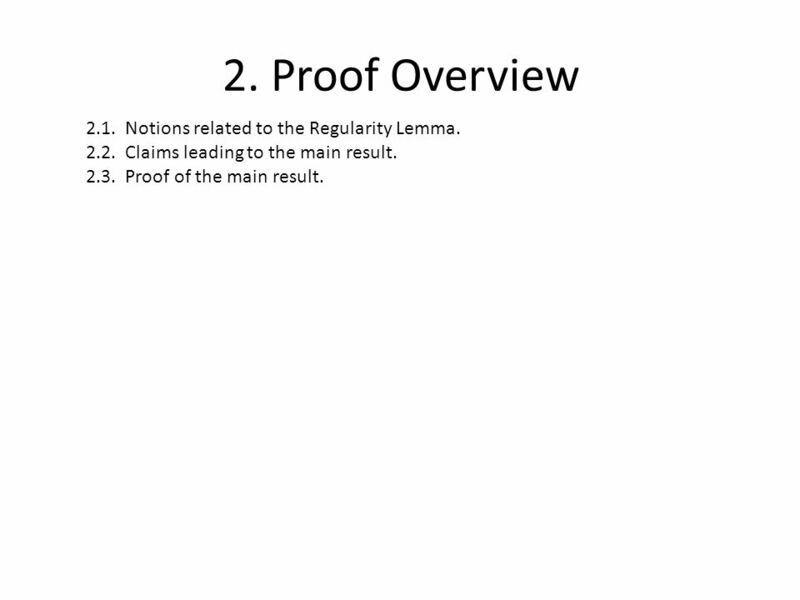 Proof Overview 2.1. 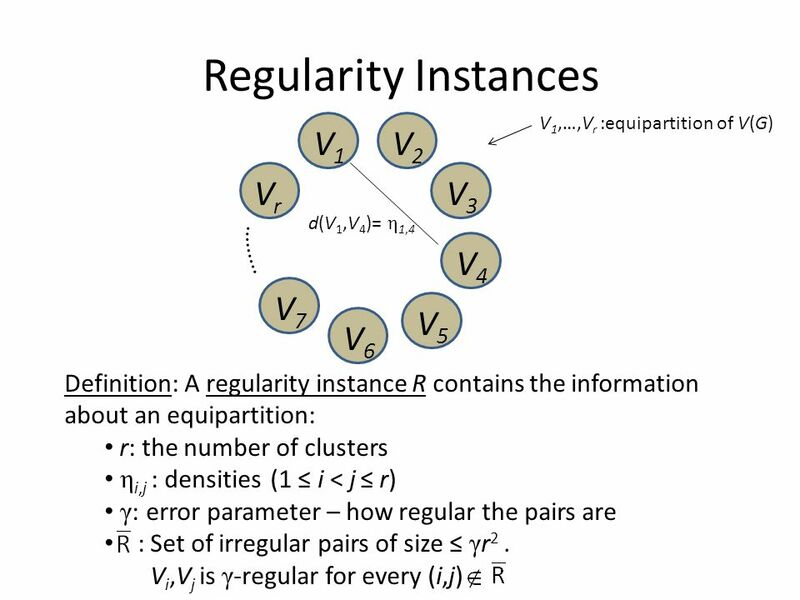 Notions related to the Regularity Lemma. 2.2. Claims leading to the main result. 2.3. Proof of the main result. 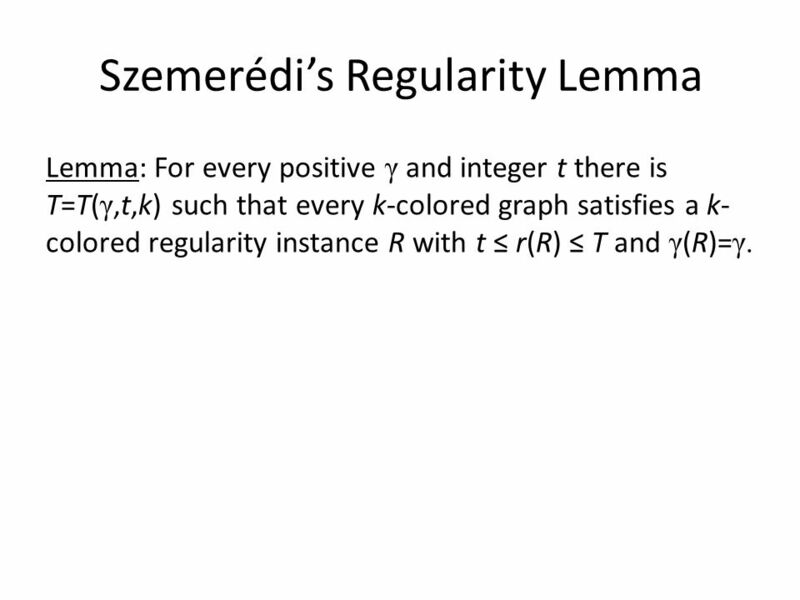 19 Szemerédi’s Regularity Lemma Lemma: For every positive γ and integer t there is T=T( γ,t,k) such that every k-colored graph satisfies a k- colored regularity instance R with t ≤ r(R) ≤ T and γ (R)= γ. 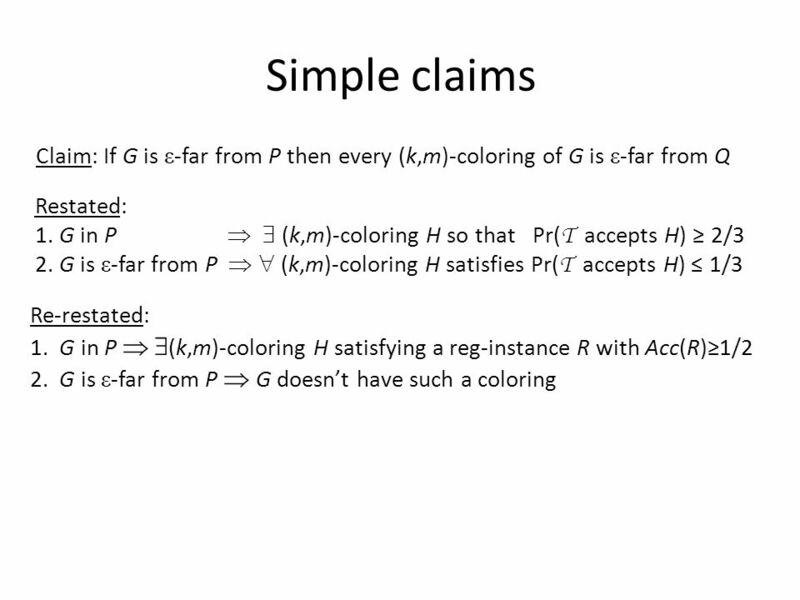 20 Simple claims Definition: 1. A k-colored regularity instance R is good if Acc(R)≥1/2. 2. 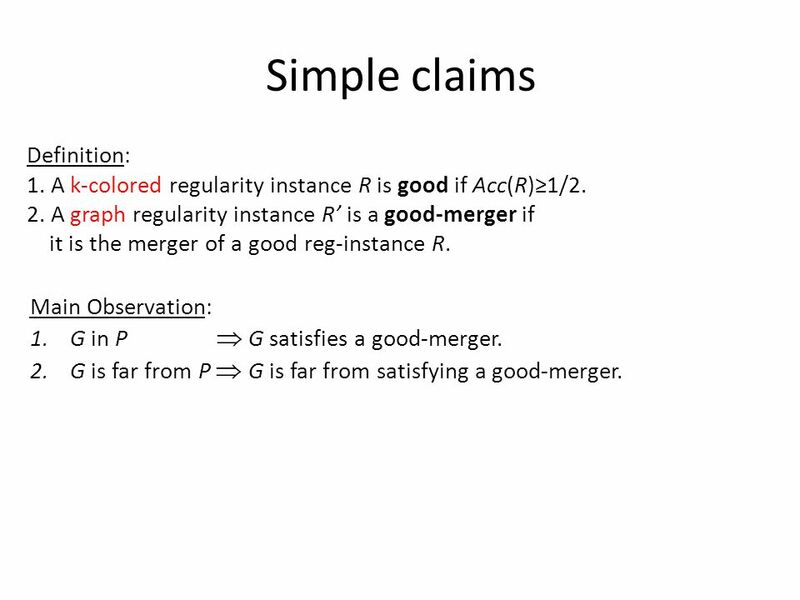 A graph regularity instance R’ is a good-merger if it is the merger of a good reg-instance R. Main Observation: 1.G in P  G satisfies a good-merger. 2.G is far from P  G is far from satisfying a good-merger. 21 A test for P: 1.Go over all k-colored regularity instances R that satisfy Acc(R)≥1/2. 1.1. Let R’ be the merger of R. 1.2. Test if G satisfies R’. 1.3 Accept if the answer is yes. 2. If all tests come back negative, reject. 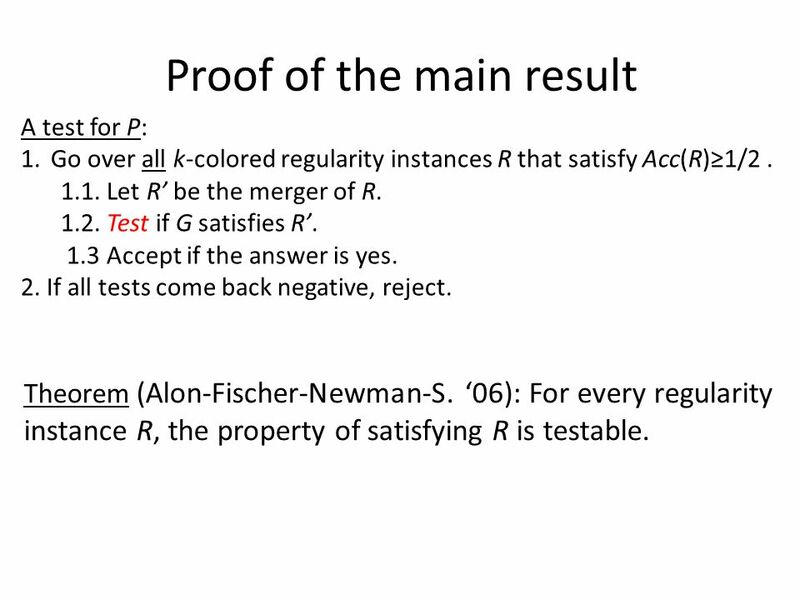 Proof of the main result Theorem (Alon-Fischer-Newman-S. ‘06): For every regularity instance R, the property of satisfying R is testable. 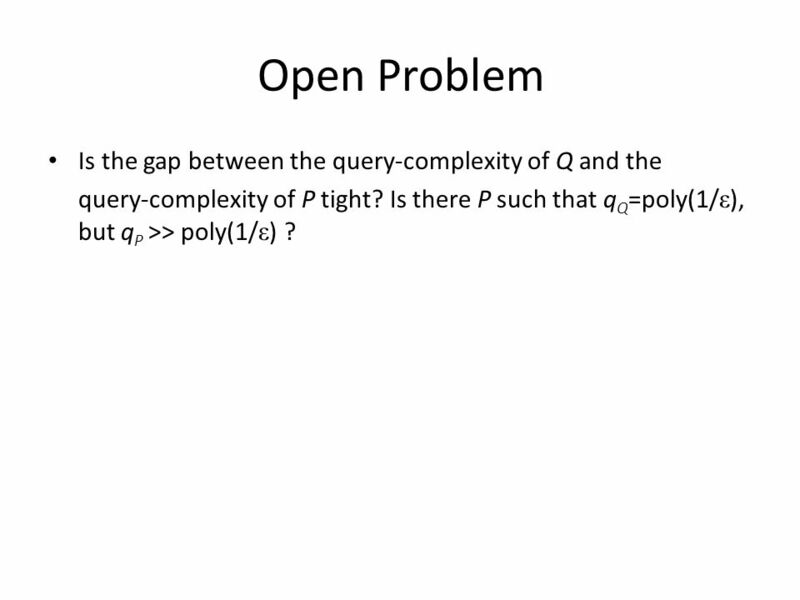 22 Open Problem Is the gap between the query-complexity of Q and the query-complexity of P tight? Is there P such that q Q =poly(1/ ε ), but q P >> poly(1/ ε ) ? 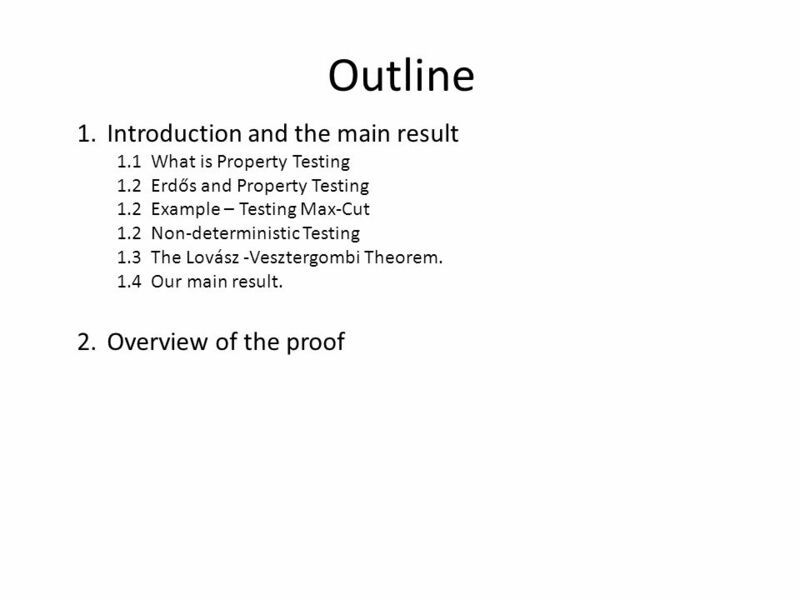 Download ppt "Deterministic vs. Non-Deterministic Graph Property Testing Asaf Shapira Tel-Aviv University Joint work with Lior Gishboliner." Lower Bounds for Additive Spanners, Emulators, and More David P. Woodruff MIT and Tsinghua University To appear in FOCS, 2006. Hardness of testing 3- colorability in bounded degree graphs Andrej Bogdanov Kenji Obata Luca Trevisan. December 2, 2009 IPAM: Invariance in Property Testing 1 Invariance in Property Testing Madhu Sudan Microsoft/MIT TexPoint fonts used in EMF. Read the TexPoint. 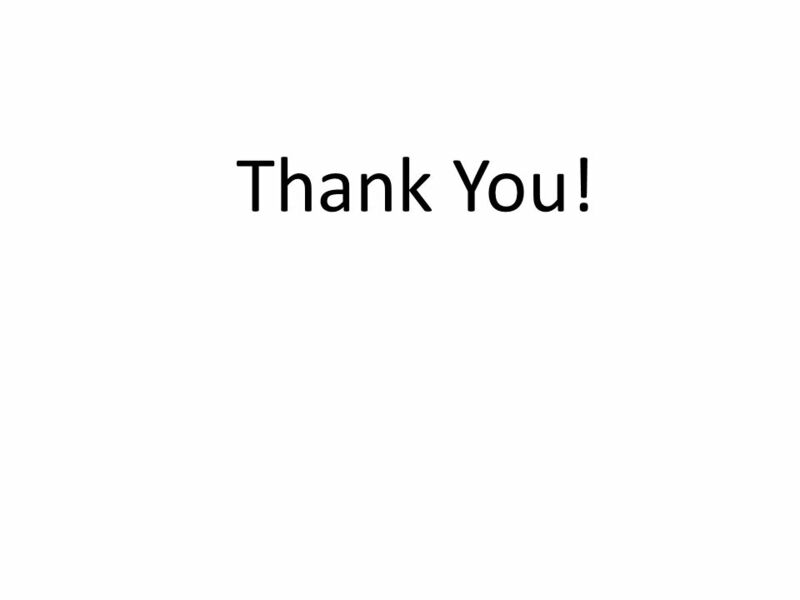 Randomized Distributed Decision David Peleg Joint work with: Pierre Fraigniaud Amos Korman Merav Parter. Min Cost Flow: Polynomial Algorithms. Overview Recap: Min Cost Flow, Residual Network Potential and Reduced Cost Polynomial Algorithms Approach Capacity. 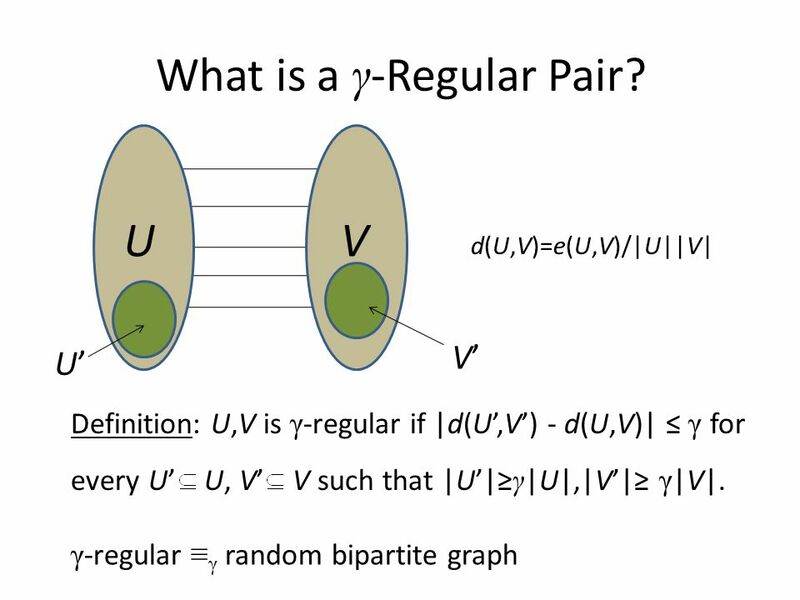 COMPLEXITY THEORY CSci 5403 LECTURE XVI: COUNTING PROBLEMS AND RANDOMIZED REDUCTIONS. Complexity ©D.Moshkovits 1 Where Can We Draw The Line? On the Hardness of Satisfiability Problems. Bart Jansen 1.  Problem definition  Instance: Connected graph G, positive integer k  Question: Is there a spanning tree for G with at least k leaves? Inapproximability of MAX-CUT Khot,Kindler,Mossel and O ’ Donnell Moshe Ben Nehemia June 05. Approximate Distance Oracles and Spanners with sublinear surplus Mikkel Thorup AT&T Research Uri Zwick Tel Aviv University. Gillat Kol joint work with Ran Raz Locally Testable Codes Analogues to the Unique Games Conjecture Do Not Exist. On the Density of a Graph and its Blowup Raphael Yuster Joint work with Asaf Shapira. COMP 553: Algorithmic Game Theory Fall 2014 Yang Cai Lecture 21. Christian Sohler | Every Property of Hyperfinite Graphs is Testable Ilan Newman and Christian Sohler. Artur Czumaj Dept of Computer Science & DIMAP University of Warwick Testing Expansion in Bounded Degree Graphs Joint work with Christian Sohler. 1 List Coloring and Euclidean Ramsey Theory TexPoint fonts used in EMF. Read the TexPoint manual before you delete this box. : A A A A Noga Alon, Tel Aviv. Why almost all k-colorable graphs are easy A. Coja-Oghlan, M. Krivelevich, D. Vilenchik. The mathematical challenge of large networks László Lovász Eötvös Loránd University, Budapest Joint work with Christian Borgs, Jennifer Chayes, Balázs.